Provide hours of classic play for your baby or toddler with toys to rattle, push, pull, sort or stack! 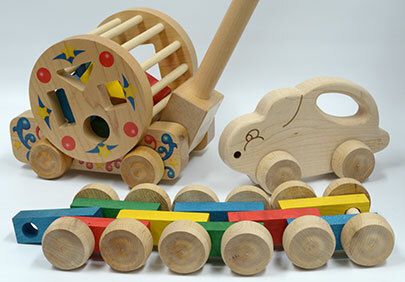 These wooden toys make excellent baby shower gifts and look beautiful in the nursery. We also have a large collection of wooden toy blocks that you won't want to miss, including ABC Blocks, Traditional Building Blocks and Printed Blocks.